Social organizations denounced the capture of a student and several injured by the gases and rubber bullets with which the Colombian Police attacked the demonstrators. Several social organizations denounced on Thursday the repression to which the Colombian students who demonstrated in different areas of the country were subjected , to demand the Government of Iván Duque the increase of the budget destined for the functioning of the public universities of the territory and in rejection of the application of VAT to the basic family basket. "At this moment we are in a state of kidnapping by the Metropolitan Police of Bucaramanga," ratified one of the human rights defenders, who along with several students were attacked in the protests at the Industrial University of Santander. During the day of protest, the arrestof a student and several wounded were reported, both by the gases released by the police directly against the people or by the bullets and rubber bullets fired by the uniformed. 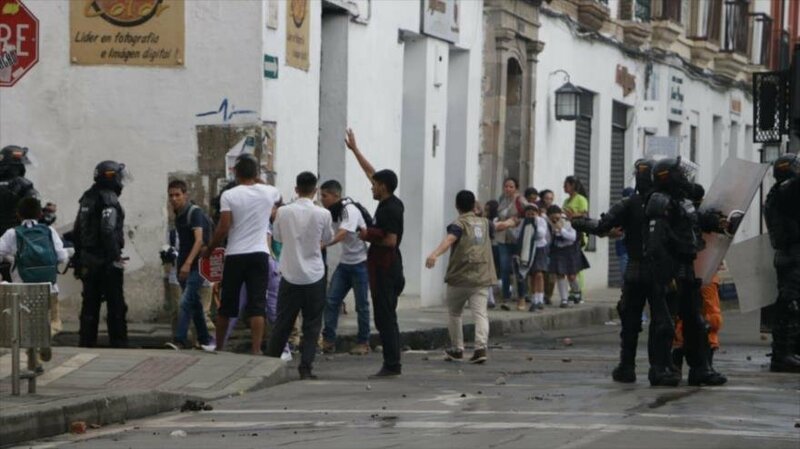 Also, a reporter from Colombia Informa, Luis Fernando Castillo Narváez, accused the police of assaulting him while he was working on a student camp installed several days ago in a plaza in the town of Popayán. Higher education in Colombia has a deficit of 3.2 billion pesos (about 1,015 million dollars) for its operation and public universities also need 15 billion pesos (about 4,758 million dollars) to invest in infrastructure, according to ratify The experts. The students demand that the Colombian president sit down to talk with them and recognize the financial deficit of the universities, so it is expected that this Friday different unions will meet to agree a national strike, in case the government does not comply with the requests.